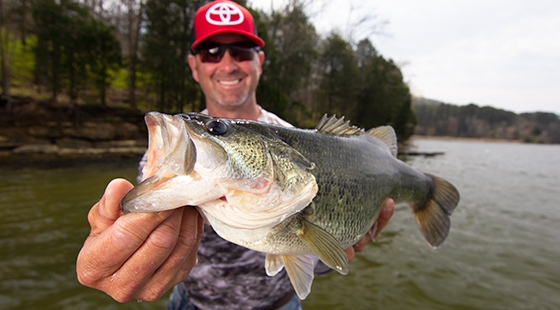 Cast a Rapala® DT®-20 upriver and bang bottom across a hump in deep water and you’re bound to catch a lot of big bass the next few weeks on Lake Guntersville and similar reservoirs across the Southeast. Swindle’s fishing buddies are on an epic DT-20 bite too. “DT” stands for “Dives To.” Built of balsa wood, Rapala’s signature material, a DT-20 will get down to its maximum depth of 20 feet sooner than – and thus stay in the strike zone longer than – lookalike crankbaits. The way its balsa body wobbles while swimming and digging its bill into the bottom make it the perfect tool for triggering bites from bass in their deep-water summer haunts. To catch deep-dwelling reservoir bass this summer like Swindle does, spool up a Disco Shad-colored DT-20 on 10- or 12-pound-test fluorocarbon line on a 5.3:1 baitcasting reel and 7½-foot baitcasting rod and follow these tips. First, use your sonar/GPS unit to locate a few hard-bottom humps or high spots in otherwise deep water, “where it comes out of like 40 feet, up to 20, and back down to 40,” Swindle advises. A Rapala DT-20 gets down to the strike-zone fast with the help of a metal disk permanently embedded in its ultra-thin polycarbonate lip. Swimming with a side-to-side action only balsa crankbaits can achieve, DT-20’s pull with ease despite the depth to which they dive. Perfectly weighted to hit the water in a nose-down, quick-dive position, they can be easily cast 150 feet. DT-20’s measure 2 ¾ inches, weigh 7/8 oz. and come armed with two No. 3 black-nickel VMC® trebles. They feature a specially tuned internal baritone rattle, premiere finishes in all the right color patterns to match local baitfish across the country. Disco Shad, an Ike’s Custom Color, is Swindle’s “number-one color, day in and day out” for targeting deep summer bass with a DT-20. “It’s a great imitation of the gizzard shad that they’re feeding on and it looks really good in that color of water,” he explains. Blue Back Herring has also been productive for him. Swindle’s last bit of advice for replicating his successful summertime DT-20 bite is to cycle through several different humps where you’ve marked fish. Be patient and persistent on each one. If your electronics show a school, those bass are likely to bite as soon as you bring the bait past them at the right angle. Is the DY 20 available now I checked all my bass catalogs with no luck. I sure would like to outfish my fishing buddy.